Tonight at 8PM EST on APTN, host Simon Baker travels to Winnipeg, where government, scientists and business leaders have come together to share their concerns about the future of Lake Winnipeg, the world’s tenth largest lake. For decades, the run off of fertilizers from agricultural production, sewage and commercial phosphates have flowed into Lake Winnipeg, creating huge algae blooms that are slowly sucking the life out of the lake, threatening the tourism and fishing industries that rely on it. Now, indigenous and non-indigenous people living all along its shores face an uncertain future as climate change is rapidly making the problems of Lake Winnipeg even worse. 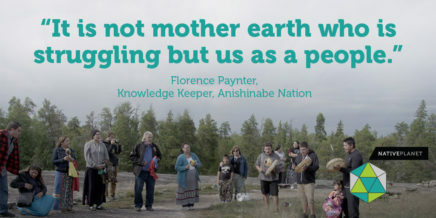 As Simon comes to understand the challenges for this great lake he travels to one First Nation community whose Elders teach their youth that solutions can only begin when we learn to value water, each other and life itself.